The Patriots got their collective butts handed to them in Nashville on Sunday afternoon to the tune of 34-10. It was ugly from start to finish. They weren’t ready to play and Tennessee was. We wrote in our keys to the game, getting off to a quick start was imperative this week. The last thing you want to do is to play from behind with the size of their offensive and defensive lines, they’ll make life downright miserable for you if that is the case, and they did. Tom Brady, like the rest of his offensive teammates, were not on the same page yesterday and not prepared to face a Titans team that was fired up and ready to go. The day started well enough with Brady firing a dime down the field to Josh Gordon for 44 yards right down the middle. And just as quickly, that changed. Brady missed on several throws were his fault. And several others where the coverage was superb. He was under duress all day and was forced to get rid of the ball early several times. While that wasn’t his fault, we wrote yesterday that it is easy to tell when Brady is struggling because he always makes the same mistakes. Yesterday, once again, when he and the offense struggle, he locks into receivers and ignores the rest of the field. He targeted Josh Gordon, Julian Edelman, and James White 32 times out of 41 passes on the day. That isn’t going to get it done. On the 4th and 6 where Edelman was blanketed by Logan Ryan, Chris Hogan put a double move on Malcolm Butler and was wide open. That’s on Brady. But he did zip some throws into very tight windows. He has to be better down the stretch…no ifs, ands, or buts. James White was rendered totally ineffective for the first time this year. The team tried to get him the ball but he was held to just 31 yards on five catches. He had just one carry and was blown up badly in the backfield for a loss of five. And to illustrate how out of sync this team was yesterday. White was bad in his pass blocking, something he’s never been as long as I can remember. Sony Michel returned from a two and a half week absence and was ineffective due to the offensive line. He had only 11 carries for 31 yards, a 2.8-yard average. Cordarrelle Patterson likewise was a total non-factor carrying the ball four times for 11 yards, mirroring Michel’s 2.8-yard average. James Develin had his first carry of the year and had a one-yard touchdown. The wide receivers had trouble all day with gaining separation. 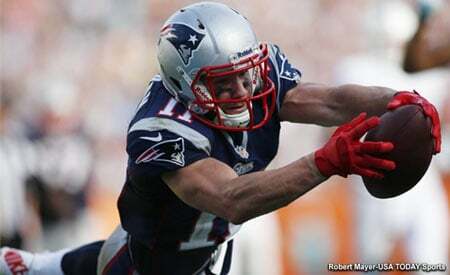 Julian Edelman gets very high marks with nine catches on 12 targets for 104 very tough yards. He was taking a lot of punishment after the catch. He was the bright spot on the offense on Sunday, before hurting his ankle. Josh Gordon had 4 catches for 81 yards including the aforementioned 44-yard bomb. But he was targeted 12 times boys and girls. That kind of ratio isn’t going to cut it…. Not for anyone, especially someone who is supposed to be the go-to guy. Chris Hogan is being frozen out of the offense. Brady barely looks in his direction anymore. And he may be replaced as the #3 option by Phillip Dorsett. Hogan was wide open for what may have been a score behind Butler who he beat on a double move. Patterson and Hogan had zero production. Dorsett? Two catches for 18 yards. Not good enough. Rob Gronkowski was out again. Worse, Dwayne Allen was shaken up twice during the game and was forced to leave. That left the Patriots with only Jacob Hollister who was active for the first time in about a month. Hollister is more of a move tight end and not an in-line blocker. He did make one nice grab down the seam for 17 yards on two targets. The team really needs Gronkowski, a healthy Gronkowski back. The offensive line was atrocious on Sunday, the worst performance I’ve witnessed from this unit in quite some time. Brady was sacked three times and was under pressure all day. The Titans completely dominated the line of scrimmage. And it wasn’t close. With Shaq Mason out, Trent Brown and Marcus Cannon missing several snaps each, there was a revolving door on the front. That certainly didn’t help with communication. But replacements Ted Karras and LaAdrian Waddle were being beaten with regularity. The running game? Non-existent which just added to the misery of the entire day. The Patriots gained just 40 yards on 19 carries. That won’t win many games, especially when the pass protection is shoddy. The defensive line was shaky in the early going, they didn’t set the edge or nor contain Marcus Mariota on the first drive of the day. They settled down and held Dion Lewis to just 2.8 yards a carry on the day. But as we pointed out on Friday, the Titans with the lead or close to it will hammer defenses with Derrick Henry. And that is just what Tennessee did. Henry gashed them with frightening ease. The pass rush was non-existent for much of the day. Trey Flowers was good but the rest of the edge? Very little was heard from them. After the first drive, they did a great job of containing Mariota in the pocket. But the pass rush is the other half. Last week was their best game of the year in that aspect. On Sunday it was poor. The Patriots linebackers had a “Groundhog Day” moment. The unit looked slow and appeared to be a liability especially Dont’a Hightower. Elandon Roberts had a couple of nice stuffs but then flies up into the gap against Henry at the goal line and misses him. How in the wide world of sports can you run by and miss a 250-pound running back? With Roberts, this happens far too often. Kyle Van Noy made a bunch of plays and had 12 tackles but like the others seemed out of position at times too. The secondary had the same kind of day that everyone else had…awful. When your best player in the secondary has been beaten for 3 catches for 63 yards and a touchdown… plus a pass interference call, in the first two drives, then you know what kind of day you are going to have. Corey Davis roasted the Patriots for 7 catches for 125 yards and a touchdown. The instinct is to look at the box score and say, “Mariota only threw for 225 yards.” But did the numbers pass the eyeball test? No. His QB rating was 125.0 and averaged 9.5 yards per attempt. The safeties didn’t have a great game. On the Titans first touchdown, however, Mariota broke containment and had a clear path to the end zone. The Pats had Jonnu Smith bracketed with Devin McCourty underneath and Pat Chung in trail. McCourty was forced to come up and force Mariota to throw…he was right in the throwing lane, and he lobbed it over him for an easy TD since Chung wasn’t close enough to influence the play. McCourty in that instance was victimized by the defensive line. Chung did have a couple of nice stops on third down where he came up and tackled the receiver short of the sticks. But after arguably their best game of the year last week against Green Bay, this was a very poor effort against a team that came in averaging just 178 yards passing per game. The Special Teams had a very mixed bag and much of it started badly. The opening kickoff had the Patriots coverage unit again have a breakdown and allowed a 58-yard return. That set the tone for the day. The Patriots allowed an average of 14 yards per punt. Stephen Gostkowski missed a 52-yard field goal wide left. That’s the bad news. The good news is Julian Edelman averaged about 15 yards per punt return, Patterson averaged 24.7 on kickoff returns, Ryan Allen averaged 49.7 yards per punt while Stephen Gostkowski hit a 52-yard field goal. So things kind of averaged out but the start was atrocious. The Patriots coaching staff totally dropped the ball on this one. This team was flat out not ready to play on Sunday at 1:00 p.m. The Titans scored more points in the first 10 minutes of the game than they’ve been averaging in a game all season. Offensively, you won’t win many games where you score 10 points. How did Josh McDaniels NOT target Malcolm Butler in this one? He was listed as the worst starting CB in all of football. Everyone has been feasting on him with double moves all season and the Patriots avoided him like Revis Island in his prime…That deserves a double F.
Defensively, they were gashed every way possible and Mike Vrable gave Belichick the big “Eff You” when they tried their own pass to the QB and gained 21 yards after Brady stumbled after catching it. That’s something the Patriots are used to doing to the opposition. Speaking of stumbling…Patriots players were stumbling all day, shouldn’t the equipment guys have adjusted their cleats during the game or did they take the day off too? Burn the tape, write it off and come back from the bye week and show the previous six weeks tape. Get that team ready to play the Jets…preferably in the first quarter. 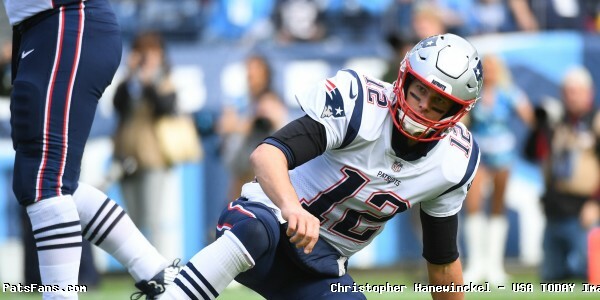 This entry was posted in 2018 Patriots Regular Season, NFL Commentary, NFL News, Patriots Commentary, Patriots Film Room, Patriots News and tagged 2018 Patriots season, Bill Belichick, Chris Hogan, Dion Lewis, James White, Julian Edelman, Malcolm Butler, Marcus Mariota, Mike Vrabel, New England Patriots, NFL, Patriots, Patriots edge rushers, Rob Gronkowski, Stephon Gilmore, Tennessee Titans, Tom Brady on November 12, 2018 by Steve Balestrieri.